The Global Tourism Summit in Honolulu has just wrapped up and delegates are once again leaving the islands with the sense that the some of the solutions to the world’s environmental woes rest in the Aloha state. Many of the speakers echoed that theme with presentations that focused on the transformative power of tourism, on ways to solve and dissipate over-tourism, how to apply more warmth and competence to face-to-face travel transactions, and how to understand and embrace the increasingly rapid digital revolution, now known as disruption. All of these fundamental themes all helped ensure that delegates numbering nearly 2,000 from 32 countries filled the meeting rooms and theatres at the Hawai’i Convention Center.That included a group of Canadian product buyers, led by the Hawai’i Tourism Authority delegation from Canada. 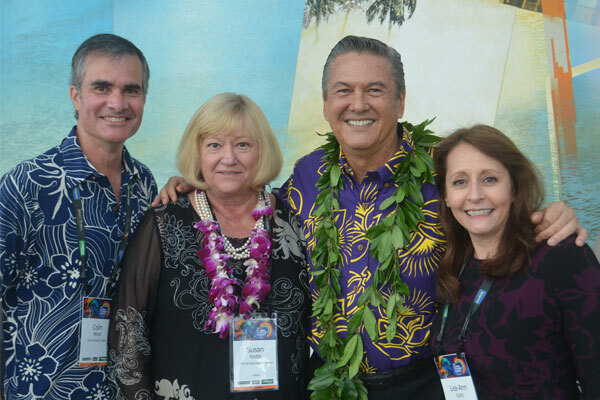 George Szigeti, the president and CEO of the Hawai’i Tourism Authority (2nd from right) met with executive members of the HTA Canada chapter, including (l. to r.) Colin Wood, account director of Hawai’i Tourism Canada; Susan Webb, president of VoX International, which manages the HTA account; and Lea-Ann Goltz, the western Canada account manager for the HTA.